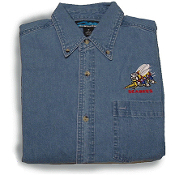 TRI-MOUNTAIN DENIM SHIRT JACKET -- A favorite here at the original home of the Seabees. This versitile100% denim cotton garment can be worn as a heavy weight shirt, or as a light-weight jacket on cool days. Double needle stitched heavyweight 8-oz denim. Use the drop down to select your size.